Before the trip, I eagerly looked forward to Peru. Now that we’ve left Peru, I hope the worst of our trip is over. This article isn’t meant to be an indictment of the entire country. This is me explaining why I had a bad time in Peru. I’m sure thousands of tourists visit the country every year and have a lovely time. We were not so fortunate. The things that happened to us could have just as easily happened in Mexico or Argentina, but they happened in Peru, so naturally the country has drawn my ire. Our first morning in Lima was exhausting. We caught the red-eye from Cancun and arrived at 5AM. We hired a taxi to take us from the Lima Airport to Miraflores, the part of town where we were staying. Before getting into the car, we agreed upon a price of 60 Soles. Our driver was a short, quiet Peruvian man that took us into our part of town without issue. Upon arrival, we got out and attempted to pay the man. We only had “big” bills on us, so I handed him a 100 Soles note, and expected to receive 40 Soles in change. He handed me a 20, said “one moment,” got into his car and rifled around the glove box for a moment. Emily and I already had our bags out of the trunk and were waiting near the curb. He reemerged from the car, chucked a fistful of change into my hand, and dove back into the car. Before I comprehended what was happening, he gunned it and disappeared around the corner. The change he accosted me with amounted to 3 Soles. Our very first interaction with a Peruvian consisted of him cheating us 17 Soles. Welcome to Peru! It’s not much money, but it’s enough to frustrate me. The next headache we endured was trying to track down just exactly how to get to Machu Picchu. For those looking at making a trip to Macchu Picchu, I have to say, the entire ordeal was an exercise in frustration. If you plan on booking it yourself, and not buying a package, be prepared to juggle multiple ticket reservations. First, you need to get to Cusco (it’s a cheap 20 hour bus ride from Lima, or an expensive 1 hour flight). 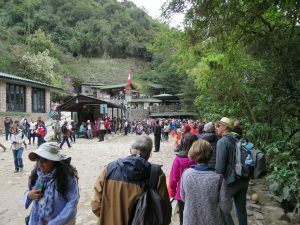 Then you need to purchase train tickets to Aguas Calientes (the tourist trap of a “town” at the foot of Machu Picchu), as no buses or flights service the place. Then you need your ticket to Machu Picchu, which is only valid for the date you select. Then you need to purchase bus tickets to the top of Machu Picchu from Aguas Calientes. Again, only valid for the date of purchase. If you miss a train, or bus, or get sick- tough. If you buy most of your tickets and then discover the train is sold out for the day you need to get there- tough. Buy new tickets (which might not be available), or don’t see Machu Picchu. Despite this, Emily managed to book everything perfectly. That said, the entire ordeal was prohibitively expensive. When I say “prohibitively,” I mean we might have to cut an entire country from our future travels as a result. We spent more on Machu Picchu alone than we budgeted for our entire stay in Thailand. Was Machu Picchu breathtaking and fascinating? Yes. Was it worth it, for me? The jury is still out to be honest. The other issue with Machu Picchu is that it is absolutely crawling with people. The city likely held 200-400 inhabitants in its heyday. Now, 4000 to 6000 people visit the site every day. As most of you already know, Emily suffered a great deal to see Machu Picchu. If you haven’t read about it yet, you can learn all about her altitude sickness, bacterial infection, and salmonella infection here and here. Once we got out of the hospital, Emily tried to pull some cash out of an ATM with her debit card, and the transaction was not allowed. We called the bank and discovered that Emily’s card had been “skimmed” and subsequently deactivated by the bank. That’s right, a card skimmer stole Emily’s debit card. So what is a credit/debit card skimmer? Basically, your less-than-honest-technologically-inclined-local-scammer places an additional card reader (the skimmer) on an ATM. When an unsuspecting person in need of cash pops their card in the ATM, both the ATM and the skimmer read the data on the card. Additionally, a camera, or keypad overlay will be used in conjunction with the skimmer to obtain the card’s PIN. Emily’s debit card was skimmed at the airport, the very first ATM we used. We had a little under $500USD taken from our account before the bank shut down the card. We are working with our bank to try and get the money back, and so far I’m optimistic we will. Once you’ve been scammed twice in the same place in a short amount of time, it’s easy to start letting the cynicism creep in. Because of the cost of Machu Picchu, Emily’s hospitalization, and her card getting stolen, we cancelled most of our other plans for Peru. The Colca Canyon, Rainbow Mountain, Huaraz, Jungle Tours- all canceled. 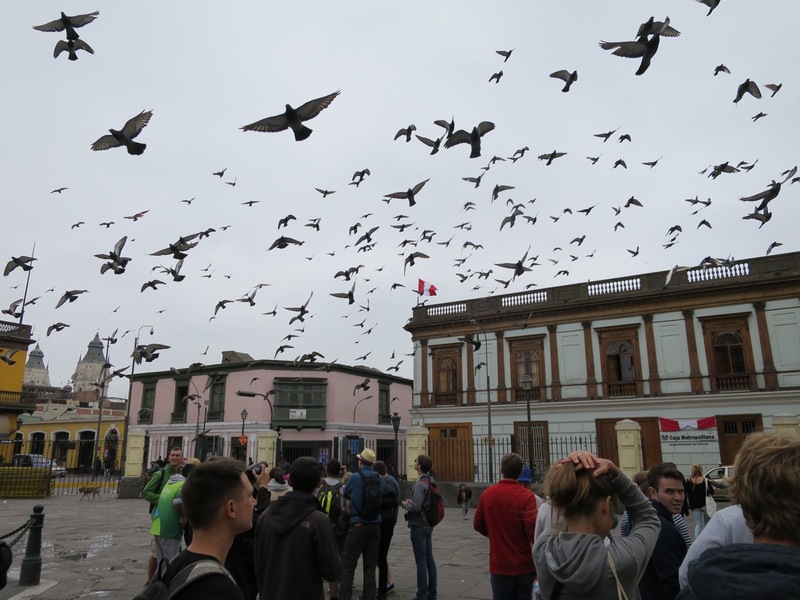 We spent our last week in Peru just hanging out in Lima, in Miraflores specifically. Something I ate along the way decided to punish me on our way out of Peru. I want to be clear though, Emily and I were being very discriminating when it came to what we ate. We weren’t drinking the water. No street food. No raw food. No ice in our drinks. Still- two separate food borne illnesses found both of us in the span of a week. Our last day in Lima, I woke up feeling rather nauseous. I spent the day in bed just feeling crappy. We caught the red eye from Lima to Buenos Aires that night, and as our time for departure neared, I took a turn for the worse. By the time we boarded the plane, I was having a hard time walking I was so nauseous. As soon as we pulled away from the gate I knew I was going to start vomiting. I don’t remember exactly when, but sometime shortly before or after takeoff (or maybe during?) I violently filled the gallon ziplock bag I had with me. Unbeknownst to me, the bag had a leak, and I ended up spilling the contents all over my shoes, pants, shirt, and the seat beneath me. This is normally where I’d put another photo, but I don’t have any photos that relate to being sick on an airplane. So… use your imagination? For those of you keeping score, our trip to Peru involved a run away taxi scam, two hospitalizations, a stolen debit card, and a budget-busting excursion. The bad luck we had in Peru was just that: bad luck. Rationally, I know that it could have happened in any other country and it was just chance that it all happened in Peru. Emotionally, Peru is a sore spot and it’s easy for me to be jaded and judgmental towards the place. I mean honestly, they didn’t have soap in the bathrooms of a hospital! If the sanitary standards are that low for a hospital, it’s no wonder we got violently ill from eating the food. I wish we had had better luck. I know that Peru has a lot to offer, and we missed out on so much of it because we blew our budget on Machu Picchu, and because of Emily’s illness. All that said, I wouldn’t discourage anyone from visiting the country, I would only caution any would-be visitors to be especially discriminating when it comes to where and what you eat, and to budget enough cash to see all that you want. See update below. Emily and I are in Buenos Aires now, and will be updating soon, with more Type I fun, and less Type II fun. We’ve now been informed by our bank that my debit card was skimmed and stolen in Peru as well. Honestly, at this point I can no longer recommend in good faith that anyone visit Peru. Frankly, the country is too dirty and the card skimmers too ubiquitous to make it worth a trip. It’s unfortunate because I wanted to like Peru and I don’t want to discourage people from traveling there but I simply don’t think the country is worth the trouble. I’d have to agree with this assessment. E. coli and altitude sickness, as well as being caught in the middle of a transportation union riot and the hairpin turns up the mountain to MP left me with zero desire to return.